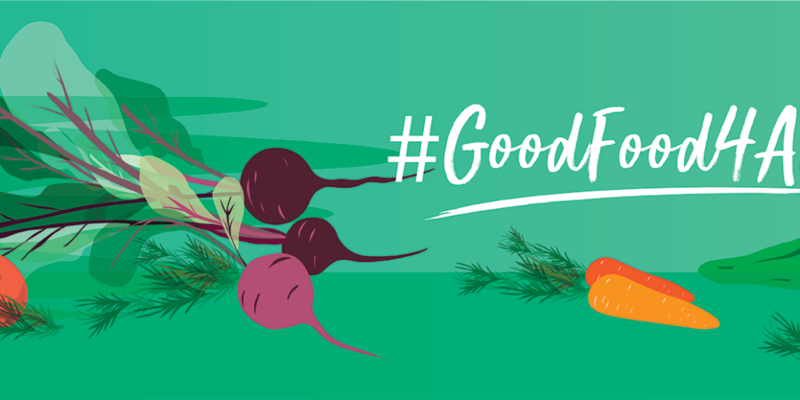 We’ve launched Good Food for All, a campaign to get us all eating food that is grown in a way that is good for farmers, good for you and good for the planet. The Sustainable Development Goals have set the task of reaching Zero Hunger by 2030. However, we’re a long way from achieving that goal, and the planet still faces huge challenges of hunger, malnutrition, obesity and environmental degradation due to agriculture. Instead of being connected to our food and how it is grown, we live in a world where food is messed around with. It’s produced using harmful chemicals that damage our health, wildlife and the environment. It’s packed in plastic and unnecessarily shipped around the world. Farmers the world over are not making a decent living. Access to quality food and proper nutrition is not a reality for millions of people worldwide. It doesn’t have to be like this. It’s time to transition to growing food in a way that nourishes soils, preserves biodiversity and protects water sources from contamination. A food system that pays farmers and farmworkers fair prices and doesn’t just feed people but nourishes them. The Good Food for All campaign wants to build a greener, fairer and healthier world for everyone. To launch the campaign, we’ve released a short animation video ‘Organic Farmers, Our Everyday Superheroes’. It explains how when farmers around the world farm sustainably, they don’t just grow food – they become superheroes protecting our soil, guarding biodiversity and defending the earth. The video is available in Czech, English, French, German, Greek, Italian, Lithuanian, Polish, Portuguese, Romanian, Slovenian, and Spanish – just check out our YouTube channel to find the version you want and start spreading the message! Real money set aside for nature, the environment and climate. We need real investment to preserve and conserve our planet’s resources now and for future generations. An end to perverse subsidies by enhancing minimum environmental rules for all farmers. Real law enforcement to make sure existing legislation is put in to practice on the ground. Improve the governance of the CAP and the performance framework. Currently 60 billion euro of EU taxpayers’ money is spent every year on Common Agricultural Policy (CAP) subsidies that mostly fund intensive and factory farming which damages our natural resources, hurting wildlife and contributing to climate change. Done right, agriculture can provide Good Food for All, generate decent incomes, and protect the environment. The Good Food for All campaign is organized by 25 partners across Europe who have come together in ‘Make Europe Sustainable for All’, a 3-year cross-sectoral project to promote ambitious implementation of the Sustainable Development Goals. #GoodFood4All.